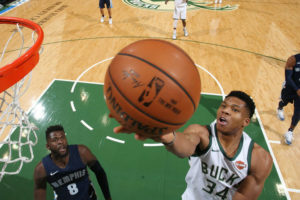 The NBA will name its all-star reserves at 6 p.m. CT Thursday night during TNT’s NBA Tip-off show and the Milwaukee Bucks are hoping for a strong showing. Aside from Bucks all-star captain Giannis Antetokounmpo, Khris Middleton and Eric Bledsoe are expected to receive strong consideration. Middleton is averaging 17.3 points and 5.7 rebounds a game. Bledsoe is tied with guard Malcolm Brogdon at 15.8 points a game. Bledsoe is pulling down 4.5 rebounds a game. The Bucks are in Toronto to face the Raptors tonight. It’s a big game for the Bucks, who lead the season series two games to one. A win tonight would give the Bucks the season series tie-breaker, which could lead to the top seed in the Eastern Conference playoffs. Eric Bledsoe poured in a season high 30 points on 12 of 14 shooting to lead the Milwaukee Bucks to their fourth straight win, 118-108 over the Orlando Magic at the Amway Center in Orlando on Saturday night. The Bucks led by as many as 19 points in the third quarter before Orlando chipped away and trailed by as little as two points early in the fourth. That’s when Bledsoe took over, scoring 12 of his 30 points in the final quarter. Giannis Antetokounmpo added 25 points, 13 rebounds and five assists. Malcolm Brogdon added 18 points on 8 of 11 shooting and D.J. Wilson finished with eight points and 10 rebounds off the bench. The Bucks closed out their stretch of five out of six games on the road with a 5-1 record. They return home for a pair of games, starting with a 1 p.m. tip against the Dallas Mavericks on Monday at Fiserv Forum. The Milwaukee Bucks announced that they will retire Marques Johnson’s jersey No. 8, making him the ninth Bucks player to be so honored. He’ll be the first player to have his number retired since the Bucks opened Fiserv Forum. The ceremony will take place Sunday, March 24th when the Bucks take on the Cleveland Cavaliers. That’s the day before Johnson’s mother will be celebrating her 92nd birthday. Johnson played for the Bucks from 1977-’84 and averaged 21.0 points a game, which ranks fourth-most in team history. His jersey retirement is considered by most as long overdue. Slow starts have been a problem for the Milwaukee Bucks recently, but that was not the case on Wednesday night. The Bucks jumped out to a 19 point lead in the opening quarter on Portland and cruised to a 143-100 win over the Trailblazers at Fiserv Forum. Giannis Antetokounmpo scored 33 points and added 16 rebounds and nine assists as the Bucks cruised to their 13th win (13-4). They’re 3-1 on their current six-game home stand. Portland entered with the best record in the Western Conference and they had beaten the Bucks in Portland back on November 6th. The Bucks got revenge for that loss on Wednesday night. The Bucks scored 72 points in the paint and hit 15 of 45 from three-point range. Six Bucks scored in double figures. Damian Lillard and CJ McCollum scored 22 points each to lead Portland in defeat. The Bucks have Thanksgiving Day off and return to action on Friday night against the Phoenix Suns at Fiserv Forum. The Milwaukee Bucks suffered an embarrassing defeat on Monday night, 109-96 to the Indiana Pacers at Bankers Life Fieldhouse. The game wasn’t as close as the final score. The Bucks trailed by 20-points or more for most of the night. Indiana went on a 20-0 run over a six minutes stretch of the opening quarter to break the game open early. By the time the dust settled on the first quarter, the Pacers were up 37-16 and let by as many as 27 points in the second quarter. The Bucks made just 5 of 18 from the field (27.8%) in the first quarter. The Pacers hit 17 of 24 from the field (70.8%) in the quarter. Giannis Antetokounmpo made just three field goals on eight attempts (both season lows). He finished with 17 points, just the second time Giannis has scored under 20 points this season. The Bucks return to the court on Wednesday night at home against the Orlando Magic (12-28). The Milwaukee Bucks saw their two-game winning streak come to an end, falling to the Toronto Raptors 131-127 in overtime at the Air Canada Centre. Eric Bledsoe led the Bucks with 29 points, scoring 11 of the teams 13 points in overtime. Giannis Antetokounmpo added 26 points to go along with eight rebounds and seven assists, but managed just two points in overtime. The Bucks trailed most of the night, but took a four-point lead (110-106) with just over two minutes to play in regulation. Then with the game tied at 114 with 3.2 seconds left, the Bucks had a chance to win it in regulation but couldn’t get a shot off before the buzzer. DeMar DeRozan set a Raptors franchise record by scoring 52 points to lead all scorers. The Bucks return home Wednesday night to host the Indiana Pacers (19-18). The Pacers are 3-7 in their last 10-games.